I had the classic childhood bedroom with the “path from the bed to the door.” The rest of the room was covered in toys and clothes. I usually knew where things were that I needed. I had a sort of spacial memory based location system that seemed to work in my head. It wasn’t pinpoint accurate but it would always get me to the correct quadrant of the room to start sifting through. The worst thing that could ever happen would be my mom putting something “away.” I would have no idea where to start looking. Very efficient, but such a system does not allow Biff to keep a TV in his room. And I’m going to go with Old Movie Week. Yesterday was A Christmas Story, today is Star Wars IV. It’s a stretch, but it’s original. Oh yeah, my bedroom too. I’m thinking household chores. If this is truly Old Movie Week, tomorrow has to feature Biff running away from a giant boulder for some stupid reason. What I loathed most, and I’m sure some people will know exactly what I mean… Was when something would get genuinely lost. Everyone would go “See? SEEEEEEEE?!?! You shouldn’t have everything laying around! This way, things get lost!” I would then proceed to list what I’ve lost in a given amount of years (good memory, mine)… Which would invariably be a very short list. Most people lose more stuff than I do… Or spend hours per month looking for the same item over and over… Which is a problem I don’t have. No Sir…I got other problems, like being awake this late, and facing the reality that I’ve succumbed to Biff’s ineffable, workaday brand of surrealism. This rather sounds familiar… although, as I’ve grown up, it has spread from my bedroom to just about every room of my house. I can’t tell you how angry that makes my wife. 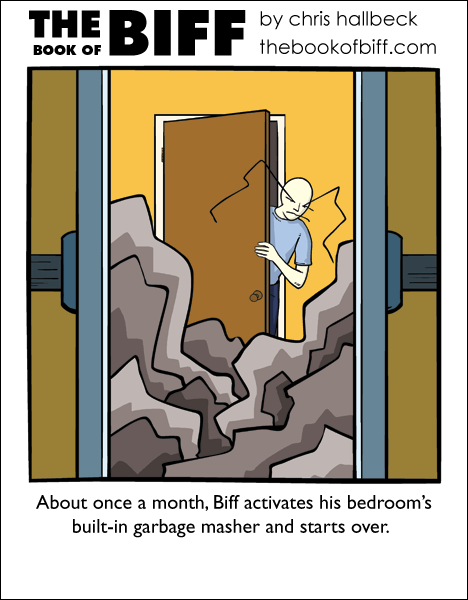 I think I should invest in a Biff-tastic method of cleaning… Who knows, it could work! My gosh my ayi(maid) has the tendency to move my stuff around when she cleans. I’m missing countless articles of clothes, a can opener, an iPod cable and countless other things. Eventually they turn up and I’m so ecstatic when I discover them again. It’s almost like an Easter Egg hunt meets Christmas. HAHA! Me too! Actually, my room still looks like that. And heaven help me if anyone decides to go in and “straighten up” or I won’t be able to find anything ever again. I should get one of those installed; be a big help next time I find a nest of eggs underneath my jackets. i need one of those for my whole apartment…it would make everything easier. I had a clean room. Oh, curse you, good child syndrome. Ha! I look at my room, I never had a path, I was the only one who could cross it without stepping on things. I had the same “ordered chaos” organization system though. my parents would force me to clean it and I’d have to tear it apart again to find something. Mine is terribly messy, but that’s the only way I know where everything is. I don’t understand how I do that. Biff, shut down all compactors on level five! So, does he have some kind of trash monster living in all that? my room is cluttered because its kind of small and all of my furniture is enormous (and yet cost close to nothing O.o). Big fan of “organisation” but “tidy” can go right away- if I just wanted to hide stuff at random, I’d throw it away. Sadly, explaining this one to my Mum at the time (And, erm, even now) was never easy. And by “easy” I mean “possible”. on a side note, where do you think up the names for these Chris? … I just wanted to thank you for that title. It made my day. .. I’m going with cleaning week. Dianoga? That sounds interesting. *Googles the word* Oh, haha. Yeah, movie week sounds right. Ahh, I never get tired of the little ‘story’ below the comment. So human. So.. Filled with nostalgia. It’s so great feeling like “I’m not the only one.”. It appears as if people lose the sense used for finding something in an ordered chaos when they grow up. It’s the only logical explanation parrents disapprove of this system. It maybe might also be related to the slice of pizza under the good shirt you only wear every second month. OK, I agree with Caffiend on this one…cleaning shortcuts. Nah, LLCoolDave, parents are more concerned with “normal”, or maybe “standard” — they probably still have the innate sense of chaotic organization, but lose the will to put up with the resulting mess because it embarrasses them too much. Haha. Chris, I thought I was the only one that happened to. I came home from school one day to find my room immaculate. Needless to say I was horrified and felt quite violated. She had hung up all the clothing in my closet in a way that I have never done. She put it in quite randomly. But my closet goes by color. So I just sorta took all the clothing out and threw it on the floor. “She” being my mother. I should proof-read before I post. I think it’s chore week. Maybe it’s Star Wars Week. I don’t know how the 1st one could connect to that, but whatever. As a kid, my room was just like that. But then, the house I lived in as a kid was small, so in addition to my clothes, my mom kept all of her clothes in there as well. I was also a major slob; I still remember when we moved and were packing up, I had found, lying underneath toys and junk that hadn’t been moved for years, various kinds of mold and fungus that looked as thought they were starting to build sentience. Nowadays, the room I’m in is 10’x10′ almost exactly, and every 2-3 months, when my parents are gone for the day, I’ll take everything out of my room – all I have is a desk with a computer, a dresser with a tv, a cabinet with a stereo, and my bed – vacuum and clean up everything, then rearrange it based on my tastes that month. It takes about 4-5 hours each time, but it guarantees that my room is completely clean until I do it again. Somehow, it seems like I have a lot less stuff when it’s all neatly arranged in shelves/stuffed into my colset and drawers. ah yes. best thing ever, rooms like that. Nobody really minds, when they come over. Despite what parents think. She thought up a solution though. Clean the whole house every Sunday. Needless to say, I don’t clean my room, but I clean the other one I’m meant to. I remember before we decided that. To clean the house, It took a whole 3 days. THREE DAYS. that includes scrubbing the walls to get the pencil off, scrubbing the floor to get the mold off etc. Also, just because I want to say so. Who says girlfriends aren’t into nerd/geek stuff? mine actually dragged me to her house and made me watch star wars and the matrix. now for the shocking part. I’ve never seen either of them before. EVER. how can I pass myself off as a nerd/geek when I haven’t seen them? HOW? that’s my rant over. sorry for that. I’m ridiculously orginized now, but I too, had the path from the door to the bed when I was a kid. Heh… I used to have way worse than that. See, the mess spilled over onto my bed. I couldn’t use my room, and it became sort of a warehouse for all my useless crap. AND IT’S STILL A MESS! You had a path from your door to your bed as a child? I should have tried that. Hey! I can start now! Daaaamn now you’re hitting home! URG. My mom got so mad at me because I couldn’t find the graphing calculator that I got in middle school, that I needed for my geometry class. She kept telling me to look for it, but I somehow knew it was completely hopeless. It wasn’t in any place I would have put it, so I just pretended to look halfheartedly while my Mom tore down the house. Anyways, I was helping my sister move from one apartment to her new home (she’s in her second year at collage) and guess what I found in one of the drawers? Yeah. My mom got mad at my sister for taking it without asking. I seriously need that for my room! I just had to comment on this one. When I was little, my parents complained that my room was too messy, since it didn’t have a clear path. So I cleared a path, and marked it off with masking tape, and brushed toys and junk off the marked path. Oddly enough, it worked for them, at least for a little while. Izual Shima – All I got is that Izual is a minor character in Diablo 2, and Shima is found as a part of many Japanese geographical terms. Whoa, Biff lives on the Detention Level of the Death Star?! that could so be my room even now. We have so much stuff it’s ridiculous. Yard sale time! We usually have all kinds of stuff laying around all over the house. When my husband decides to “clean,” he just takes everything and puts it somewhere out of sight. He never remembers where he put everything, and I never see my stuff again. Can actually grow to be many, many times the size of the one in episode IV. my ocd has me continually cleaning my room but because i organize-reorganize and rereorganize i often forget were i put something then i have to tear my room apart to find it and put it back together again. and again. and again.